**GIVEAWAY** What the heck, a blade and a light to the winner. It’s been entirely too long since my last giveaway. I have no excuses. So I will try to make up for it with a light and knife package giveaway. Nothing too crazy or exotic. Just a decent example of each. Thorfire TK18, got this with another light I bought. Great dual switch tube light. Ramping and mode sets. I like the ramping on this one. Not too fast and not too slow. It’s pretty good. Now I did ditch the stock emitter, whatever it was. It now has a Luxeon V2 5000K in it. It looks great with the OP reflector. Think BLF A6 in 3D, that will give you a good idea about the beam and tint. Not a scratch or mark on the light. I have the box and accy’s for it. A small Y-Start blade. The Mini Bean I think they call it. A frame lock with a hair over 2 inch blade in 440C and a tan G10 slab on one side. Has a pocket clip as well but would be at home on a keyring or just carried loose in the pocket. Nothing fancy. Good letter and box opener. Has a leather pouch it comes with it. I also have the box for it as well. Only two rules for the giveaway. One, just post “I’m in” and, well, you’re in. Two, if you decide you don’t want it after winning, pay it forward, do your own giveaway or pass it on to someone who could use it or can’t afford it. I’m sure they would appreciate it. Karma will find you if you post it up for auction two days later on Ebay. No geographical limitations I suppose. As long as I can get it to you and it won’t cost as much as my cell phone bill, well then, you will get it. It being the 13th, lets run with this for 2 weeks. Abby will pick a winner on the morning of the 27th, fish bowl style. Your “I’m in” will get that post number in the fish bowl. Abby (my daughter) likes these giveaways more than I do. She will log in a dozen times a day to see how many people are joining in. She will pick the number and do her you’re the winner pose. Enjoy the weekend my friends. I’m in! Would be a great start to a blade collection (as well as a nice light!). I’m not in this time (not my kind of light) but I’m nevertheless happy to see another GAW. I also have some overdue….but not yet, the budget is locked. Funny and generous. I’m in! Thanks for the giveaway, toddcshoe! Thanks for this GAW, toddcshoe. With such a nice blade: I’m in. I am in. Thanks for the chance. I am in , thanks! 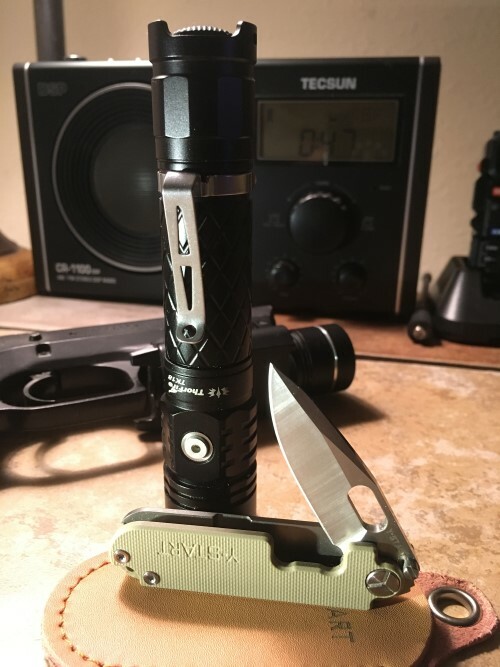 I’m in just for the knife, don’t have any EDC blade other than my X-Acto. If I eventually win, Abby could pick the bowl twice and let the second person get the light (I’ll cover the shipping to whoever the second winner is). I’m in! Thanks for this opportunity! I'm in! Thank you, everyone has a chance! Wow! I am in. Thanks! i am in. thanks and good luck. I’m As prior person. But in rev. I’d like the light but pass on the knife to a second draw. Just let me know what freight is for it, and I’ll pay it for you. 2 winners of anything are ALWAYS better than one hey. You are a very kind and generous BLF member .. I'm in ...If I win I'll giveaway one and enjoy the other . Thank you for your generosity toddcshoe!